Lori Faye Bock’s art celebrates her subjects with wit and charm. Her paintings work on many levels, touching our spirit, stimulating our minds and enlivening our space. Her paintings contain a wealth of elements. They are at once sophisticated and naïve, whimsical and spiritual, contemporary and timeless. We delight in their color. They engender positive feelings. Whether she depicts animals, a subject for which she is deservedly famous, or a fanciful landscape, or a room with a view, Lori Faye Bock brings her own unique viewpoint and style to the painting. Do You Know Where Your Sheep Are? Animals—in the home or yard or on the farm—bring their own special joys and lend their richness to our lives. Lori Faye Bock captures the essence of these animals and makes us believe in their presence. She understands the sometimes happy, sometimes contrary relationships that people and animals have on a daily basis. 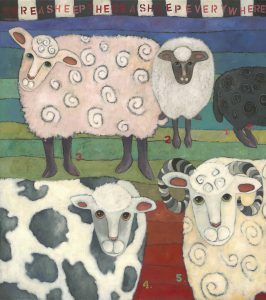 Depicting these ups and downs has intrigued Lori Faye Bock throughout her career and comes from her own experience with animals. Anyone who has had an animal friend will recognize the truth and essence she depicts. She is a master of portraying attitude and subtlety of expression. There are soulful cats and spirited dogs, and all manner of sheep with distinct personalities. There is a range of behavior. Cats sleep on your best chair, or lounge in the sink, dreaming of goldfish. Animals are not our imaginings of them but are wholly themselves, both naughty and nice. As one of America’s most popular animal artists, Lori Faye Bock delights animal lovers near and far with her colorful and endearing companions. Through her paintings, she is able to communicate to individuals, both young and old, the humane and kind treatment of animals … for the act itself and for the positive impact it has on the future of our society. During the past seven years, many of her designs have been featured in national publications as well as in public awareness campaigns on behalf of several national organizations, the City of Albuquerque as well as local humane societies, animal shelters and rescue groups across the country. 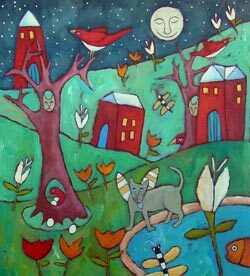 Lori Faye enjoys collaborating with people to create commissioned paintings of their companion pets. She lives and paints in an early 18th-century adobe farmhouse in Los Silvestres, a small agricultural community located just north of the village of Abiquiu in northern New Mexico surrounded by her six cats, six dogs, and a flock of the spotted, biblical Jacob sheep. Lori Faye’s relationships with her animals are reflected in her delightful work. Enter a little world where the sun always shines and you meander down country roads, over gentle hills and through small villages, encountering a cat or dog as you go. On the way, you’ll see fish cavorting in sparkly streams and ducks playing in ponds while trees gesture and flowers beckon. You might just find what you’re looking for, but of course, the journey is all, and the land sings its own existence. Lori Faye Bock re-creates her own love for the land in these transcendent paintings that speak more of a vision of worlds in harmony than of a fixed place or moment in time. She draws from her experience living in various locales around the country, yet conjures the essence of landscape, imbuing her works with a feeling of otherworldliness. These enchanted landscapes bring feelings of peace, inner joy, and freedom from care to all who encounter them. Windowscapes combine interiors, still life, landscape and even animals in paintings that celebrate the beauties of the natural world and the domestic world. Lori Faye Bock has always held affection for what she calls “simple, ordinary household objects,” which in her hands become objects of art and beauty. Cups, saucers, clocks, teapots, flowers, bowls of fruit, chairs and tabletops are transfigured into an alluring array of shapes and decorative elements. They call us to sit at the table and partake and gaze into the hills beyond. Just through the window, gardens with adobe walls, sunflowers, and desert night skies proclaim that beauty is both within and without. Lori Faye Bock’s ABC paintings most likely originated from her experience teaching first grade, where a sense of humor was critical to survival. 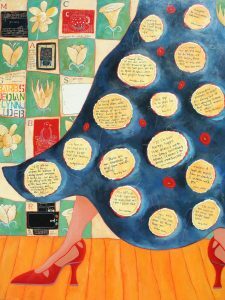 Her ability to communicate wit and a wry vision of reality comes through in these paintings, which incorporate stenciled letters, illustrations, and written commentary. They are the artist’s answer to the mystery of how words and images relate to one another. We respond to these paintings on an instinctual level, stemming no doubt from the constant interplay in our own lives between pictures and words. In these works, Lori Faye Bock both stimulates our intellects while engaging our color sense. We are children, we are adults, and we are charmed. All images © Lori Faye Bock and may not be printed or downloaded for commercial use.